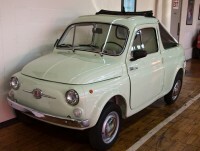 This fiberglass-bodied, Fiat 500-based microcar was built in San Remo, Italy by Carrozziere (Coachbuilder) G.A.M.C. Baldi. 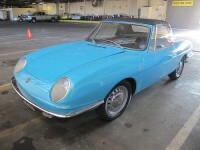 Baldi produced several different Fiat and Renault-based models, but the Frog was by far the most popular. 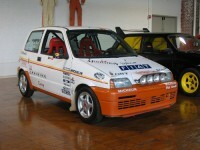 This car started life as a Fiat Cinquecento. 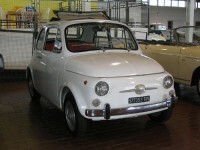 You can find an early example of the Cinquecento–the Fiat 500--in the micro car area. As rallies are a very popular form of motorsports in Europe, most manufacturers offer “kits” to transform a production car into a rally car. A testament to the adaptability of the Fiat 500 platform, this apparently homebuilt homage to coachbuilder Giannini’s Camioncino (translation: pickup truck) is itself based on the Fiat 500K Giardiniera (wagon). During the 1960s and 70s, rugged utility cars had become very popular with the public in Europe. Manufacturers seemed to share a common design for these cars: take an existing model, strip it down to its most basic components, and market it as “rugged” and “fun”. 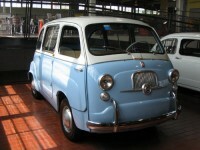 One year after the introduction of the Fiat 600, another version was introduced–possibly the first minivan–the Multipla (which means “all service”). This vehicle had three rows of seats for a total capacity of six people, the two rear pairs of seats could be folded into the floor, leaving a large flat loading area. 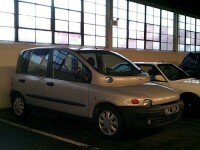 Fiat reintroduced the Multipla in 1998 to capture the growing minivan market. Initial sales were slow as the controversial styling scared buyers away. Introduced on July 4th, 1957, the successor for the Topolino, the “Nuova (which means “New”) 500" used a layout similar to that seen on the 600 with a rear mounted engine driving the rear wheels and independent suspension on all four wheels. 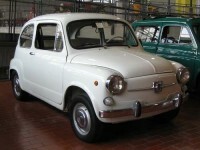 Introduced in July 1957, the successor for the “Topolino,” the “Nuova (which means “new”) 500" used a layout similar to that seen on the 600 with a rear mounted engine driving the rear wheels and independent suspension on all four wheels. The Fiat Panda was introduced in 1980, and was meant to be a city car for the masses; simpler but in the spirit of Citroën’s 2CV.